Funeral service for victims bombing. Nariman El-Mofty/AP/Press Association Images. All rights reserved. This was the scene outside St. Mary’s church in Nasr City on 12 December, 2016, a lot further east from the Coptic cathedral where 25 Copts were killed in an explosion the day before. The funeral had been moved to this location in fear of public anger directed at the security services, and Sisi himself, as was evident by chants the day before soon after the explosion took place. More security was present to prevent mourners from entering the church to grieve their lost ones than there were preventing explosives into St. Peter’s church at the cathedral. The funeral of the victims of the cathedral bombing was militarized and politicized by the state, attended by officials for damage control, invitees and only one member from each of the victim’s families. The event left Copts and indeed many Egyptians bitter and enraged. Before Daesh (ISIS) claimed responsibility for the attack, a few suspected the state. That security forces are suspected of such a heinous crime may sound incredulous and even conspiratorial, but that belief is derived from a similar event in recent history. On new year's eve of 2011, Al Quddissin church in Alexandria was bombed. Echoes of this horrifying explosion, which left 21 dead, still ripple to this day. Similar to the more recent bombing, lax security had been reported. Back then there was huge suspicion the whole matter was orchestrated by security services. Around ten days following this event, on 11 January 2011, a man got on a train and shot six Copts, killing one aged 71. As the perpetrator fled the scene, passengers grabbed him by the coat, but he managed to escape leaving it behind. Inside the coat, he had left his ID which identified him as a low ranking policeman. To absolve itself of responsibility, the Ministry of Interior (MOI) later claimed he was mentally unstable. However, that incident deepened the suspicion that the MOI, headed by the infamous Habib El Adly, was behind the attacks. 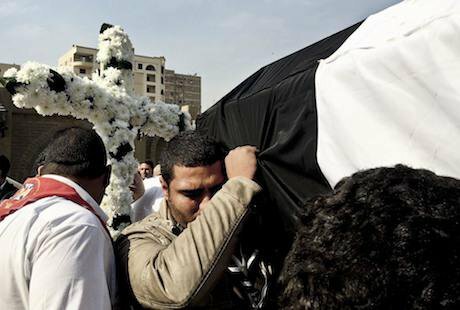 Mass protests took place in early January 2011 with the firm belief that security services were at least complicit if not the perpetrators of those deadly attacks on Copts. Later, in March 2011, following the storming of State Security, it was claimed that documents had been found tying the MOI to the church bombings. Furthermore, it was the army’s APCs in October 2011 that ran over Coptic protesters outside the Television building in Maspero. To add insult to injury, the police forces stood idle as thugs attacked that same cathedral in April 2013 under Morsi, and even shot tear gas canisters inside its premises. While this incident bears the clear markings of an extremist terror group, anger at security forces is justified. If nothing else, Egyptian security is guilty of at least gross negligence. Yet despite this clear failure, Egypt’s president Abdel Fattah Al-Sisi wrote on his official Facebook page: “The St. Peter’s church event was not due to security deficiency, but a strong blow to terrorists.” The statement left many confused suspecting it was from a parody account. This harrowing attack must not be examined in isolation merely as a breach in security. It is not only a result of careful planning by extremists, and a colossal failure by the Egyptian security apparatus. It is the result of long term policies. Throughout Egypt’s recent history, there exists an entire culture of promoting the inferior Copt. Whether it’s through sectarian incidents whose perpetrators are mostly unpunished, through state policies or prevalent rhetoric, Copts are asked to isolate themselves and resign themselves to being the weaker party. The direct attacks on Copts are viewed by some as an attack on national unity rather than directed against Copts, which entrenches us further into a narrative of denial. Copts don’t enjoy equal rights despite the ever appealing rhetoric Sisi exported to the west that he is there to protect minorities. To date, there are grave restrictions to building churches and even applying repairs. The Egyptian state has provided Daesh with all the ammunition it needs to target Egypt: angry youth. Suffice to say that an elderly woman was stripped naked and paraded around a village by a mob, while the state remains reluctant to hold the perpetrators accountable, and that a governorate refused to name a school after a killed policeman because he is Christian. Moreover, under Sisi’s rule, the space for peaceful opposition has been narrowed immensely with tens of thousands of political detainees and an intense crackdown on civil society. Police brutality continues against both the guilty and the innocent, and we do not know who is who. Many are tortured and mistreated. The Egyptian state has provided Daesh with all the ammunition it needs to target Egypt: angry youth. Egypt's oppressive climate and cutting down on freedoms has encouraged radicalization to be a more prevalent option instead of peaceful opposition. Together with the incompetence of security forces and the growing contempt for the Egyptian state, it may prove very difficult to protect various sites from suicide bombers. Explosions like these are terrifying, not just because they kill innocent people but because they embolden extremists and serve as a pretext for the security state to infringe on even more innocent people’s rights. Perhaps the state will address security and place more personnel to guard churches, build walls and block roads, but is that a solution? Some media outlets have called for the reinstatement of the emergency law and harsher punishment for terrorists. But one has to wonder what effect that would have in a country whose security apparatus is already acting with impunity, threatening, arresting, torturing and killing victims who have no recourse. What effect will such measures have when people are tried in military courts notorious for lack of fair trials, or even civilian courts which help imprison indiscriminately? How would stricter laws be beneficial when laws are enforced selectively to serve political agendas rather than justice? The answer is not harsher security, yet it's the only answer we are always given. The Coptic church along with many of its constituencies has staunchly supported Sisi and the regime. Its leaders turned a blind eye to all atrocities committed, joined the bandwagon of criticizing human rights and urged its members to forget past crimes, such as the Maspero massacre. They remained silent as their economic conditions worsened along with the vast majority of Egyptians, in the hopes that they would at least be safe in their churches. Their most formidable allies, at least in theory, were revolutionaries who fought for equal rights for all. Islamists in power did very little to alleviate the sectarian nature of the state but rather confirmed it. It was natural for Copts to hedge their bets on those who removed the obvious sectarian threat, powerful enough perhaps to protect them. The answer is not harsher security, yet it's the only answer we are always given. In choosing so, the church (not all Copts) had to watch, and forcefully cheer on, their most important allies as they were defamed, imprisoned and mistreated. They had hoped to avoid returning to being a vulnerable minority as they were under Mubarak, SCAF and Morsi. Little by little these hopes started to fade, showing reality, to the status quo Egypt has been accustomed to. With this past incident, these hopes have now been destroyed. While it was supposedly extremists who performed this terror act, the regime’s dereliction of its duties is inescapable. More terror incidents took place after Sisi’s mandate to fight terror on 26 July 2013 than before, to warrant such a mandate. Less than a month ago, 15 Coptic houses were attacked in Sohag governorate, with minimal government response to deter assailants. Until equality and justice are within reach for all, what can Copts do to survive and how much more will they be forced to bear?